Katja is the German editor of LinuxFocus. She likes Tux, computer graphics, film & photography and the sea. Her homepage can be found here. Guido is a long time Linux fan and he likes Linux because it gives you choices and freedom. You can choose and develop solutions according to your needs. 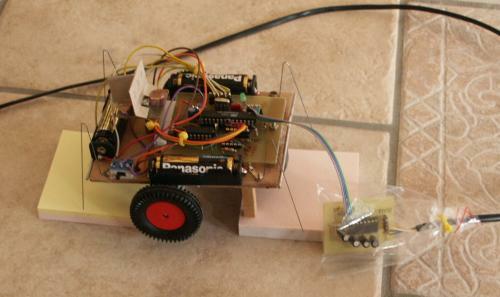 In this article we describe how to build an autonomous robot with a microcontroller that will always try to walk to the brightest spot. Two years ago we presented a "Linux-controlled walking robot" in LinuxFocus. It was very special in its design as it walked on legs and had no conventional motors. This was a very interesting aspect of this robot, however it was very slow, needed a lot of current and required a lot of special parts and skills to build it. The design of our new robot is very different. It is cheap and you will be able to build it from parts that are available almost everywhere around the world. 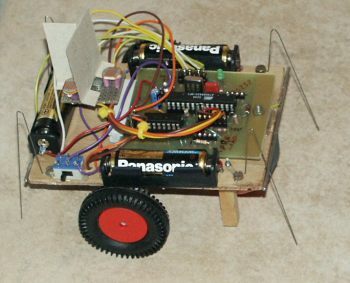 It is an autonomous robot controlled by an AVR microcontroller. As an autonomous robot (not controlled by a person) we programmed it to run towards the brightest spot in the room. A standard servo modified to work as a motor. This is probably the best solution but we had this idea only after the robot was already built. 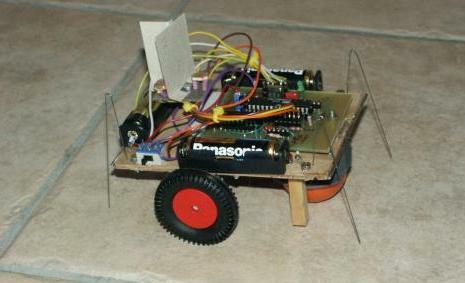 The robot has only 2 wheels which are driven by 2 independent motors. The third wheel is a ping-pong ball. This enables the robot to turn on the spot. We have used rubber wheels from toys but you don't have to dismantle yours too. The top of a marmalade jar with a rubber band around also makes for a very nice wheel. For an autonomous robot it is obviously important that it can operate from batteries. Since the microcontroller runs with 4.5V the motors also must work with 3-4.5V. They must also not take too much current otherwise the batteries and the control circuit will get too big and heavy. For this design we use an integrated motor driver chip, called l293d. The l293d motor driver chip can drive peak loads up to 0.5A. The motors should therefore need less than 0.5A under worst conditions. We used 2 small gear-box motors from Conrad (www.conrad.de, part number: 242802) but you can also use any other small motor with a gear-box. In fact we think now that the best solution would have been to use standard Servo Motors as used for the remote control of small boats, cars or planes. Normally these Servo Motors can turn only a certain angle but you can open the gear box of the Servo, take out the stopper, remove the potentiometer and the electronic. 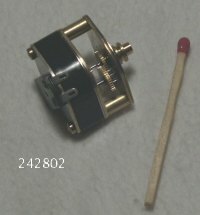 It's a perfect small but strong motor and Servos are easy to get. 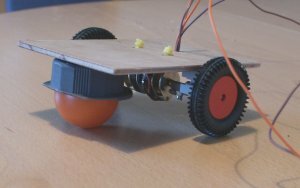 To build the robot mount the motors under a small wooden board (12cm x 9cm) and position them almost in the middle such that most of the load will be on the two axis. 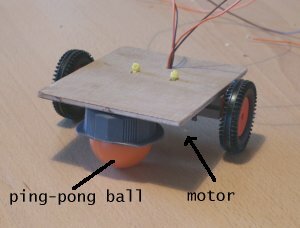 The third wheel, the ping pong ball, must take only a small fraction of the weight of the robot to ensure that it can slide nicely in its "bearing" (see pictures). The bearing for the ping pong ball is the top of a small plastic bottle which happened to have exactly the right size. For the operation of the robot we have used 3 AAA batteries. Position the battery holders as shown below. The batteries are quite heavy so take care that most of the load is on the wheels and only a little bit on the ping pong ball. You can place a switch to power on/off the robot somewhere on the side. There are 4 touch sensors mounted with a screw on the corners of the wooden board. 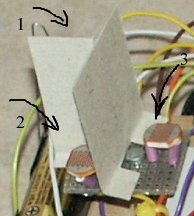 When the robot hits an object then the steel wire (2, see picture below) touches the second wire on the board (3) and this closes the electrical connection between steel wire and wire on the wooden board. 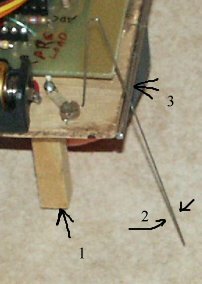 To prevent that the steel wire bends off when the ping pong ball is not in its bearing we have added a small wooden post (1) under the board. This post must be about 5 mm above ground when the ping pong ball is in the bearing. 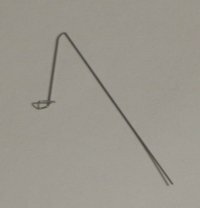 The steel wire should end about 5-7mm above ground. The light sensors are 3 photo resistors. We placed card board between the photo resistors as shown in the picture below. This card board creates shadows on the resistors when the light comes from the side. Only when the light comes exactly from the top it will provide for an equal amount of light on all 3 sensors. Comparing the values of the 3 sensors the robot can decide in which direction to go. You can solder the 3 photo resistors on a small experimentation board (those boards with a lot of holes) and fix the whole thing with a single screw on the robot. How to connect the sensors and the two motors to the printed circuit board with the microcontroller will be explained further down. Now that the mechanical parts are done let's have a look at the "brain" of the robot. We use an AT90S4433 microcontroller as the "brain" of our robot but the "brain" can't directly deliver enough power to drive the motors. This is where the L293D motor driver chip comes into the picture. This chip contains 4 digital output amplifier stages with extra protection diodes to protect against high voltages induced by the coils of a motor. 2 of the output stages can be used to drive one motor. This way it is possible to let the motor turn left or right. We put one motor between output 1 and output 2 and the other between output 3 and output 4. The enable pins of the chip can be used to control the speed of the motors when we send pulses of variable length to the enable pins. The rest of the circuit is very simple: We use the Atmel AT90S4433 microcontroller again. You know this microcontroller already from previous LinuxFocus articles. Its analog inputs can be used to measure the light on the photo resistors and the touch sensors can be connected directly to the digital input lines as shown below. More information about the details of the microcontroller can be found in Guido's March 2002 article: Programming the AVR Microcontroller with GCC. The circuit works with 4.5V. Three AAA batteries are therefore enough to operate the robot. The complete Eagle circuit diagrams and board layouts can be downloaded at the end of the article together with the software for this robot. We don't describe the board layout here. You can see it in eagle. The circuit board is small enough to fit between the batteries. Below is a drawing where you can see which touch sensor on which side of the robot is connected to which pin in the circuit diagram. The drawing also shows how to connect the motors. The polarity of the motors is chosen such that the robot would move forward (in the direction of the arrow) if +3V would be connected to the "+"-pin and GND to the "-"-pin. 1y to 4y are the names of the pins on the l293d. We don't want to go into a lot of details here. 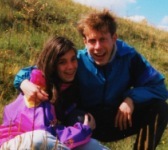 The main program can be found in the file linuxrobot.c (download of the software at the end of the article). The program includes a lot of comments and should be easy to read for a C programmer. The main loop first checks the analog values of the photo-resistors by running the Microcontroller's internal analog to digital converter in single shot conversion mode 3 times. After that the touch sensors are checked. If any of these touch sensors is pressed then they take preference over the light sensors because it probably hit some obstacle. The robot will turn the motor a few milliseconds in the opposite direction of the touch sensor which was hit. If no touch sensor was hit then the photo sensors are compared with each other. This comparison is done in the function compare_with_tol() where we compare one value against a mean value of two. To avoid that we are affected too much by "noise" we say that 2 values are equal if the difference is less than 5 percent. Based on the comparison of the photo sensors we can then decide which motor to turn. Since we have only 2 wheels we can turn the robot on the spot by turning one of the wheels faster or even turning them in opposite direction. Since the microcontroller repeats the measurement very fast several times per second the movement of the robot looks as if it continues even if we stop one motor for a fraction of a second in order to turn a bit left or right. When you assemble the electronics it is always a good idea to test it in steps. This way you can easily narrow down possible faults. There are 3 different test programs included in the linuxrobot software package (download at the end of the article). The program ledtest causes the 2 LEDs to blink. You load it with the command "make ledtestload". This will compile the program and load it to the microcontroller. The 2 LEDs should start to blink immediately after the program was loaded. When this test is successful you can be sure that the microcontroller with its oscillator and the connection to the PC for loading software does work. Next is the motortest program. This test program implements "an electronic rubber ball". You load it with the command "make motortestload". The motortest program checks the touch sensors all the time and if one of them is hit then the robot moves away from the sensor that was hit. If you hit the robot with your hand on one side then it will bounce back. Put your second hand behind the robot and it will bounce back and forth between your 2 hands like a rubber ball. If the robot passes this test then everything except the light sensors and the RS232 connection is tested. The robot should periodically print the values of the light intensity it has measured with the photo sensors. When all the tests are passed you can load the final program into the robot with "make load". The best playground for the first tests is a room with just a single lamp in the middle. The robot should just run straight in the direction of the lamp and stop there. It is quite fun to see how it turns around if you put it on the ground with its back facing to the light source or how it avoids shades. We started this robot as a little experiment. It was good fun to build an autonomous robot which can make decisions on its own and does not need any data connection to a PC. The program included in the linuxrobot package which you can download further down in the article is still small and simple but does what we wanted: The robot runs to the brightest spot. The touch sensors are only checked in rather large intervals (few ms) which limits the responsiveness of the robot. They should be checked more often. If one of the touch sensors was hit then this takes priority over all other things and the robot moves for a few hundred milliseconds in the opposite direction. If a different sensor hits during this time then this is currently ignored. The sensitivity of the photo resistors decreases in poor light conditions. This can lead to the effect that the difference measured between the sensors is below the threshold which is hardcoded in the program (5%) and the robot thinks that all sensors get equal amount of light. The light values that come out of the ADC could be adjusted by a non linear filter curve to compensate this effect. At the moment the linuxrobot program is small and simple so you should be able to understand it and maybe develop it further. It needs only 50% of the memory of the 4433 microcontroller so you can still add a lot of things. The good thing about this robot is that the hardware is somehow generic: It's basically 2 motors and some sensors attached to a microcontroller. All the logic is implemented in the software. That means by changing the software you can change almost everything as you like. download page for this article: Data sheet for the l293d and possible future updates of the linuxrobot software can be found here.